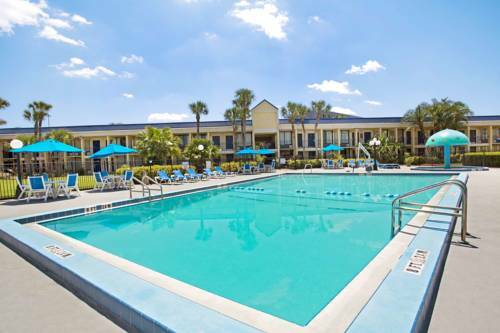 Days Inn Orlando Florida Mall has a fantastic location in beautiful South Orlando on US 441. We can be easily accessed from the Florida Turnpike, Beachline and I-4. The Days Inn Florida Mall is within walking distance of Florida Mall, the largest retail center in Central Florida, featuring many upscale stores, including Saks Fifth Avenue, several movie theaters and over 20 restaurants located nearby. The Days Inn Florida Mall is only 10 minutes away from the Orlando International Airport and its central location puts our guest only minutes away from all the attractions and convention centers. Our Orlando hotel offers free shuttle service from Orlando International Airport from 6am to 11pm daily, for non-group bookings only please. Our staff takes pride in making your stay a comfortable and relaxing one. Our property features top quality beds, free continental breakfast, free parking, Meeting and Banquet facilities, along with beautiful decor in each of our rooms. And if you thought we could not give you more, think again. Our large suites feature large sitting area. We welcome you with a smile and hope to see you soon. The Days Inn Florida Mall our rooms feature upgraded room furniture package featuring state of the art mattress. You will also find microwaves and refrigerators that blend in nicely in our well appointed rooms. Hotel amenities for our guests include a fitness center, guest service desk that sell attraction tickets, an extensive complimentary business center and a free continental breakfast. Our front desk is able to receive packages for guests at a nominal fee.